How to make simple syrup for cocktails, tea and more — it's as easy as its name! Ready to take your drinks-stirring skills to the next level for this summer's cookouts and backyard parties? 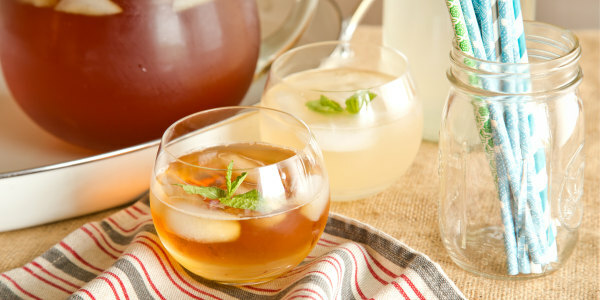 Take a tip from top bartenders and make your own simple syrup — with just two ingredients, it really is a simple way to add sweetness to everything from glasses of cool iced tea and lemonade to sangria and margaritas. If you've ever struggled with stirring the heck out of your iced tea or iced coffee to make a sugar packet dissolve, you'll appreciate the science behind simple syrup — by pre-dissolving the granules in hot water, the sugar solution is, well, simple to stir into other liquids. That's why bartenders keep it on hand for all manner of cocktails. And it's oh-so-easy to customize with your own favorite flavors: Add mint for ready-to-roll juleps (just add bourbon!) or a few sliced strawberries for a splash of fruity fun in a vodka or rum drink. Experiment with your favorites and stir up a signature drink for your next party. Now doesn't that sound more refreshing than your run-of-the-mill beer?